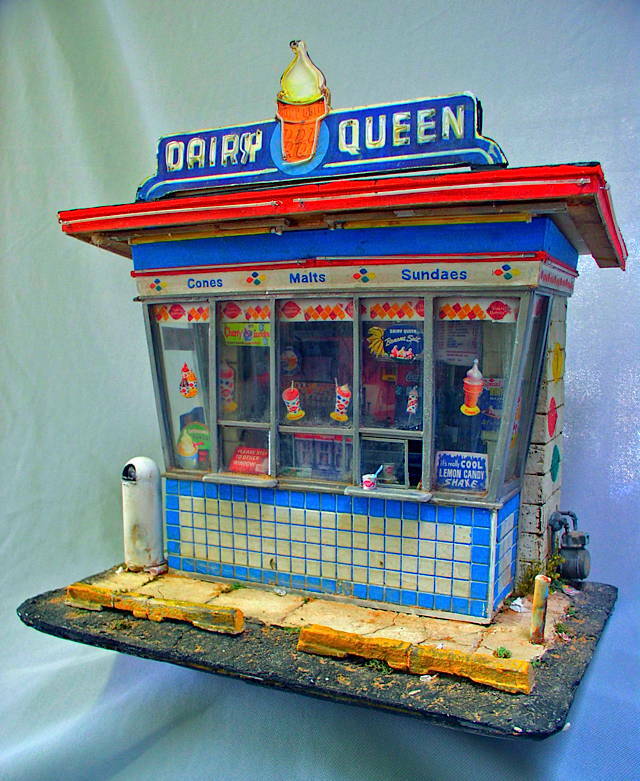 I head down to her corner for a tall, cold, frosty one. When I'm with my DQ princess I'm never there alone. For just another dollar, she'll gladly dip my cone. 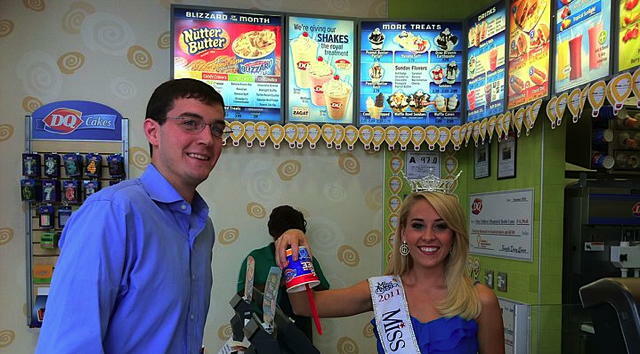 My baby's a Princess of the Dairy Queen. I crave her flavor. She don't treat me mean. She's a smooth vanilla softy. She's the center of the scene. My baby makes me order my big banana frozen. The boys line up to see her. She's the one that's chosen. She's just a small town mama but still an ice cream star. She's the only one around who'll grab your Dilly Bar. She's a steamed hot chocolate malted. She's the center of the scene. But tomorrow she'll be serving it to Curly, Moe, or Larry. She's deep-fried tofu toffee. She's the center of the scene. Like "Ninja Warrior Pinball," or "CyberRoad to Mandalay." She's workin' hard for tips all the big boys wanna slip her. She'll gladly change your dollars and let you pump the flippers. She's a deep dip Dilly Bar. She's the Blizzard Breeze supreme. She's the town's roadside attraction. She's the center of the summer's action. It's just a little job -- pumping soda for the jerks. It don't pay all that much, but she's never out of work. She's a hot fudge filly. She's the center of the scene. Went to a DQ a couple years ago and found only disappointment. It was bound to happen to a company that cut 2/3 of it's market share right off the top by offering vanilla only. Incidentally, I'm one of those rare sorts that prefers vanilla over chocolate, but business is business. Can't recall ever being closer to one that going by at the speed limit. Guess I've missed a lot. 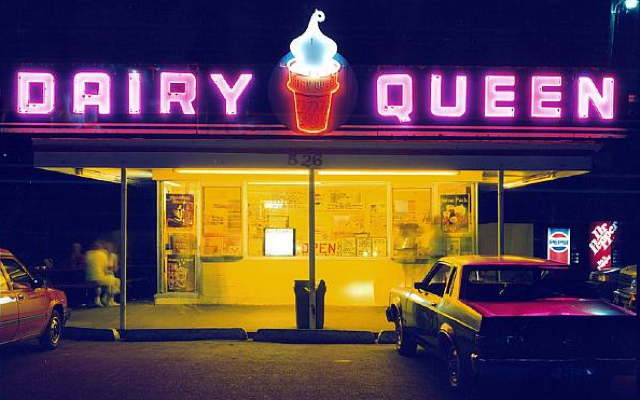 Dairy Queen in Fairfield CT in July. That's where I saw her. Dairy Queens are almost guaranteed to have a clean restroom. Is that poem an original composition? Is it a song? Has a recording been made? It reads like it would be right for rockabilly or 1950's style rock & roll. I wrote it as a song but I don't know any bands. And there was me thinking it was a Chuck Berry composition and was surfing You Tube to play the vid. You got me there, Gerard. Chuck would have bought it, without doubt. Could have been a platinum disc. 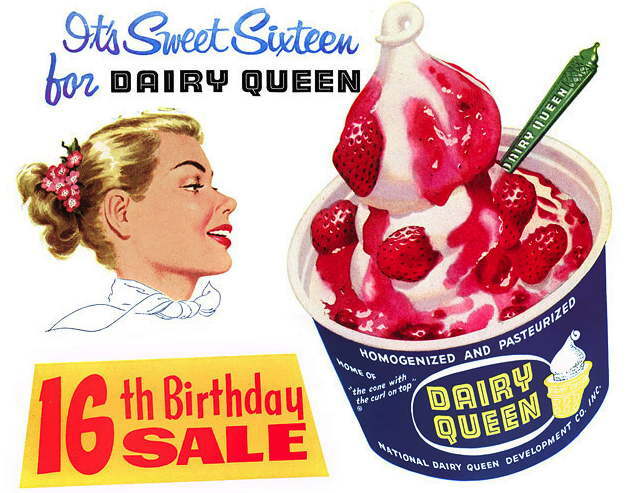 Haven't thought about my Dairy Queen Princess in decades. 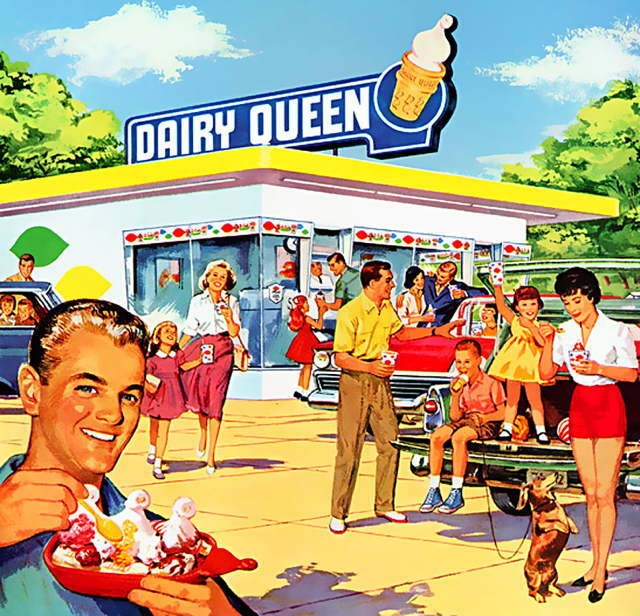 Dairy Queens are must stops for clean restrooms (at least most of the time). Order a Medium Size "Blizzard". With Oreo, and Heath Bar. Be sure to ask them to ensure that it is well-mixed, all the way down to the bottom of the cup. Option. If you prefer Chocolate ice cream, they'll add Chocolate Syrup for you, before the mixing. It's good either way. Try it though. I prefer the vanilla, as it makes the Oreo & Heath flavors more pronounced. What a slice of Paradise.